High winds closed part of the M4 and another major road was flooded as Storm Freya moved across Wales on Sunday. Traffic was diverted off the M4 between junctions 41 and 42 because of winds on Briton Ferry bridge. 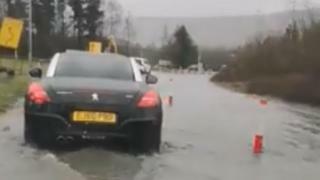 Police also shut a five-mile stretch of the A465 between Hirwaun, Rhondda Cynon Taff, and Glynneath in Neath Port Talbot, after a river burst its banks. At one point more than 1,200 homes were without power and the Met Office's wind warning ran until 06:00 GMT on Monday. The highest wind speed was recorded in Mumbles where the Met Office said there were gusts of 76mph (122km/h) and South Wales Police earlier tweeted conditions on Gower were "atrocious". On the roads, the Severn Bridge had a 40mph speed limit in place as the main carriageway was closed westbound due to strong winds. The roads had all reopened by early on Monday. The Cleddau Bridge in Pembrokeshire reopened after earlier being shut while there were speed restrictions on the Britannia Bridge on Anglesey. The Met Office had warned dangerous conditions on the roads could lead to some travel disruption, but two earlier accidents on the M4 have not directly been attributed to weather. Hirwaun councillor Karen Ward said road works on the A465 have not helped the problem of flooding. "I'd say that it's happened about half a dozen times over the past couple of months," she said. "Today has been made worse by the fact that there were road works on the A465 - it'd been closed down to one lane because of, ironically, repairs to a culvert." On public transport, Irish Ferries cancelled all of its services from Pembroke Dock on Sunday but StenaLine services from Fishguard operated as normal, while some train services were affected. The bad weather also led to power cuts being reported across Wales throughout Sunday with more than 2,000 outages across the day. The storm has been driven by cold air from Canada, which is energising the jet stream and in turn intensifying low-pressure systems in the Atlantic, the Met Office explained.